Once upon a time, there were cherries in the spring, followed by apricots, nectarines, peaches, and plums in the summer, spilling over into fall. Our choices were simple, or so they seemed. Today, stone fruit season brings all of the above and everything in between in a rainbow of colors and flavors: apriums, pluots, nectaplums, peacharines, pluerries, and even peacotums (part peach, part apricot, part plum). Where did these designer breeds come from? Hybridization is nothing new, nor was it invented by humans. For thousands of years, new plant varieties have developed in nature through mutation as well as crosses between plants. “A lot of the varieties that have been established for hundreds of years were the result of hybridizing, whether it was prompted by humans or not,” says Bryce. In classical plant breeding, the fruit breeder collects pollen from one variety with desirable traits and applies it to the blossoms of another variety. If the cross is fruitful, the breeder keeps the seeds and plants them. The seedlings are grown out, and several years later the breeder finds out what traits have prevailed. This type of artificial selection can take place between varieties within the same species (intraspecific) or between closely related species (interspecific). Although classical plant breeding methods have become more technologically complex over the years, the basic concept remains the same. In contrast, genetic engineering is a modern invention developed in the late 20th century. Genetically modified plants are created in a laboratory using high-tech methods to insert genetic material from one plant or organism into the genes of another plant, creating species that would have almost no chance of occurring in nature. Some of the earliest experiments in selective plant breeding were conducted around the turn of the 20th century by pioneering horticulturist Luther Burbank, who developed the first plumcot (a 50/50 plum-apricot hybrid) and the Santa Rosa plum, as well as hundreds of other varieties of fruits and vegetables, on his farm in Sebastopol. While the plumcot was too delicate for commercial success, Burbank broke new ground and planted the seeds for breeders to come. In the latter half of the 20th century, aesthetics, durability, and storability guided much of plant breeding, which meant flavor took a back seat. But in recent years, there has been a dramatic shift toward sweetness, due in large part to Floyd Zaiger, a man who is considered by many fruit aficionados to be the modern master of interspecific fruit breeding. 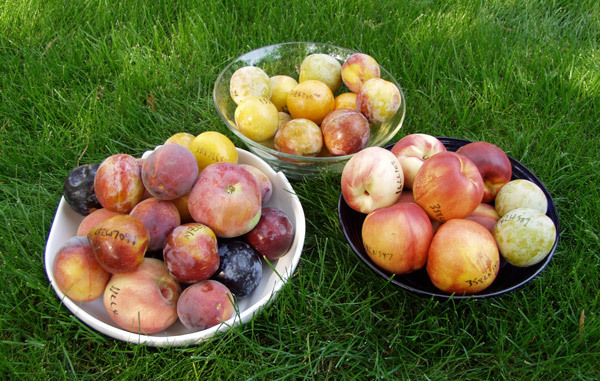 In 1989, Zaiger built on Burbank’s work when, after many years of plant breeding, he introduced and trademarked the pluot, a plum-leaning stone fruit developed by crossing multiple generations of plum-apricot hybrids, and the aprium, another plum-apricot hybrid that tends toward the apricot side of the spectrum. Flavor King and Dapple Dandy pluots bear Zaiger’s trademark, as do many other popular interspecific and intraspecific varieties. Pushing the envelope of interspecific plant breeding, in 2007 Zaiger patented the Bella Gold peacotum in 2007. A three-way cross, the peacotum combines the sweetness of a peach with a hint of the plum’s tartness, all wrapped in an apricot-like fuzzy skin. Staying ahead of stone fruit trends is not the only priority at Blossom Bluff, which grows upwards of 120 varieties. The Loewens are always seeking out cultivars that have unique flavor profiles and market demand, while filling in any gaps in their harvest calendar. The Loewens have also grown Damson plums, an English subspecies with a long history. Damsons are not the sweetest of stone fruit, but their distinctive blue-purple skin and complex, somewhat astringent flavor have made them a favorite among jam makers. Learn more in CUESA’s Farmers Market Guide to Stone Fruit. Look for Blossom Bluff Orchards at the Ferry Plaza Farmers Market on Saturdays. Fruit bowl photo courtesy of Dave Wilson Nursery. Damson plums photo by Jonathan Billinger. This article was updated from a previously published version.